In early December 1854 a group of about 150 Poles from Upper Silesia arrived in Galveston, Texas. Among them were the father and brothers of Father Leopold ( a nephew Thomas Moczygemba, born in Panna Maria would be the first native Polish Texan to be ordained). They had traveled nine weeks on the sailing ship “Weser”, they then walked the 200 miles to the place picked out for them by Father Leopold. They reached a site 60 miles south of San Antonio, a hill that overlooks the junction of the San Antonio River and Cibolo Creek. According to tradition they arrived Christmas Eve 1854, and beneath a large oak, the offered their first Mass, and named their new home Panna Maria. During the next few years more immigrants from Poland would arrive in Texas, about 1500 in all. The first years were hard, they were subjected to heat, fever and Indian attacks. The unexpected conditions discouraged the settlers. Some even suggested hanging Father Moczygemba! One story told is that a group of new arrivals were invited to dinner by the good Father. After listening to their stories of hardship, he assured them that the worst was over, at that moment a rattlesnake fell out of the roof and onto the dinner table. While some of the early settlers moved to San Antonio, and other sites, the rest began building their community. The first homes were of wood and mud with grass roofs. In February of 1855 Father Leopold recorded the first baptism and in early spring plans were started for the construction of their church. On September 29, 1856, Father Leopold said the first Mass in first Polish church in America. The new settlement had its growing pains. By the late 1850’s the bulk of Polish immigration was to San Antonio, new settlements arose in Bandera in 1855, and St. Hedwig in 1857. The Civil War was a terrible time in Texas, and the years immediately afterwards were worse. Although newly arrived and with little in common with the slave-owning southerners, the Poles formed the Panna Maria Greys. This cavalry unit was mustered into Confederate service and saw action in Texas, Arkansas and Louisiana. The different language, dress and customs of the Poles and suspected Union sympathies caused problems with Anglo Texans during these years. But still the community continued. In 1866, St. Joseph’s the first Polish school in America was started in Panna Maria. The first classes were held in a shed adjoining the church, but within two years a two story schoolhouse and rectory had been built. Sisters from the Order of Divine Province from Castroville were to be the teachers. Their first task through was to learn Polish, as the parents insisted the children learn both English and Polish! In reality the site at Panna Maria was a poor choice. The land was poor and plagued with drought fever, insects and as already noted rattlesnakes. Many of the early settlers moved on to new Polish communities. 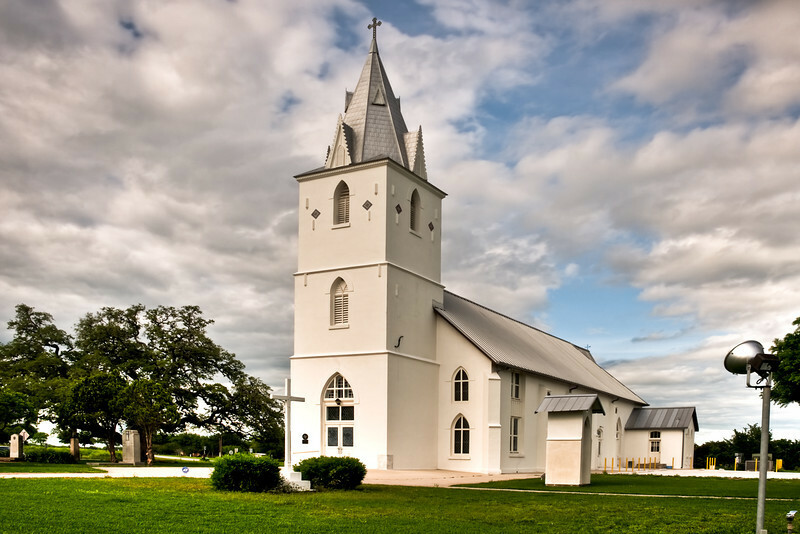 By 1880 Texas had 17 Polish Catholic parishes, more than any other state. In 1884 the railroad bypassed Panna Maria. Most of the business in Panna Maria, moved to Falls City or Karnes City with were situated on the Railroad. Today Panna Maria, consists of little more than three buildings. The original church was hit by lightning and destroyed by fire was rebuilt in 1877. This plain white structure was remodeled in 1937 and is still in use today as the Immaculate Conception Catholic Church. The school building remains but is now a museum. John Twohig,s barn, one of the first brick buildings in Panna Maria built 1855, and today is Snoga’s Grocery and Post Office. Panna Maria, Texas is located about 50 miles southeast of San Antonio, Texas – 11 miles west on FM 81 off of Texas Highway 123. On the second Sunday of October every year, Panna Maria, hold a reunion and Turkey dinner. The proceeds of the dinner are used for the restoration of the Church. Pamphlets and postcards collected by the author while in Panna Maria.